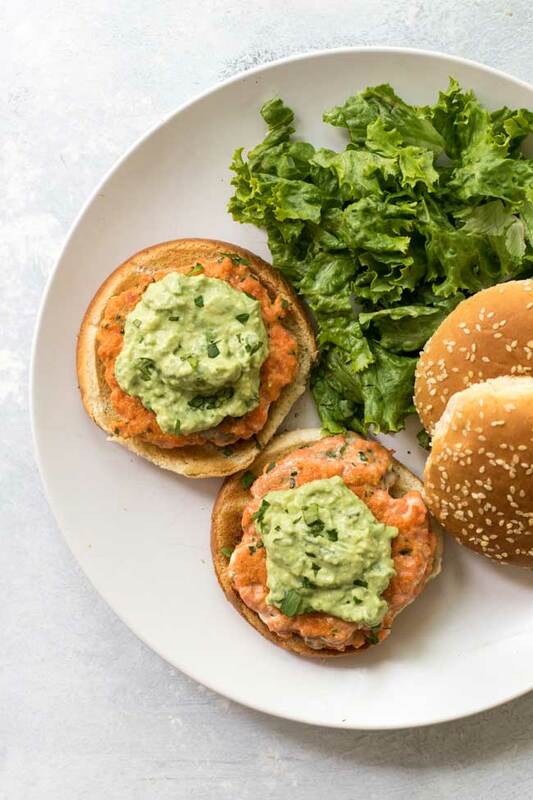 Fresh salmon burgers topped with a creamy-cool avocado mayo. The burgers have some zing thanks to some fresh lime zest and chopped cilantro and they take about 30 minutes start to finish. They’re a great way to switch up burger night! I’m guessing we all know the benefits of eating more salmon, for example, it’s full of healthy fats, protein-packed and, in general, a good choice for our bodies and minds. I’m not a nutritionist, but you don’t need a health degree to know that choosing a salmon burger over a beef burger might just be a good thing to do for ourselves. Maybe not all the time (because beef has a place, too), but sometimes, when a burger craving hits, it’s nice to switch things up, if not for our health than for our taste buds. It’s good to keep things fresh and surprising. But first, the salmon fillet: Most likely, when you buy your salmon, it will have the skin attached. You will need to ask the fish person to remove it for you or use a sharp knife at home to detach it yourself. To chop the salmon either use your knife or a food processor. You’ll want to chop it finely, but be careful not to turn it into mush. If using a food processor, plus it a few times until it resembles hamburger meat. To make patties that won’t fall apart as you cook them, you’ll need an egg and a small amount of flour which will act as a binder holding the burgers together as they cook. The salmon on its own is full of flavor but for an extra zing I like to add some lime zest and fresh cilantro to the mix. 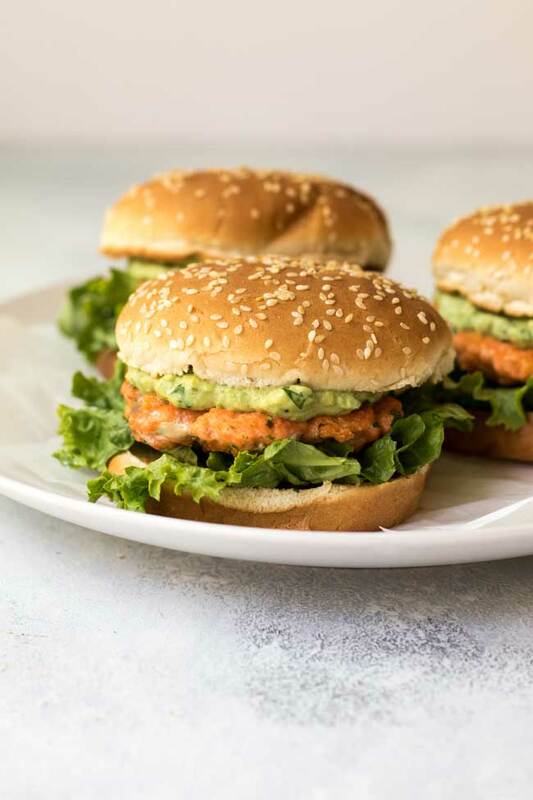 The salmon burgers cook fast – it only takes about five to six minutes until they’re ready! A small avocado: At my store, there are the big avocados sold individually and smaller avocados in mesh bags that are sold in pairs. If your store doesn’t have the ones in the mesh bags, buy whichever ones you can find. You’ll need approximately 1 cup of mashed avocado. And, like the burgers, you’ll need some fresh cilantro and some fresh lime juice. So here’s to salmon and to burgers. Putting the two together is such a delicious thing. 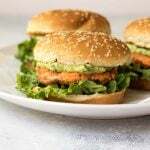 Fresh salmon burgers topped with a creamy-cool avocado mayo. The burgers have some zing thanks to some fresh lime zest and chopped cilantro and they take about 30 minutes start to finish. These are a great way to switch up burger night! Make the avocado mayo: In a small bowl, combine the mayonnaise, cilantro, lime juice, salt, and avocado until smooth. Place the bowl in the refrigerator while you make the burgers. Make the burgers: Combine the salmon, egg, salt, flour, cilantro, and lime zest in a medium-sized bowl. Form the mixture into four burger patties. In a 10-inch non-stick skillet, heat the olive oil over medium heat. Cook the patties for 2 to 3 minutes on each side. To serve, place some torn green leaf lettuce on the hamburger buns. Top with the burgers and the avocado mayo. When you prep the salmon, first remove the skin by detaching it from the meat with your knife (or ask your seafood person to do this for you when you buy it). To finely chop the salmon, either use your knife or you can chop the salmon in a food processor. I used Pepperidge Farm Hamburger Buns with Sesame Seeds. Depending on the brand you use you will need to adjust the nutrition estimates. Post, photos, and recipe updated from the archives. First published 2011. Yum, these flavors sound great together, thanks for sharing! 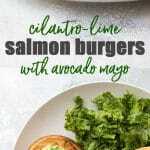 Cilantro and lime sounds fantastic for salmon burgers, thanks for sharing. Yum! I have so much cilantro growing in my garden, it’s not even funny, and I love salmon. Thanks for sharing a great recipe!